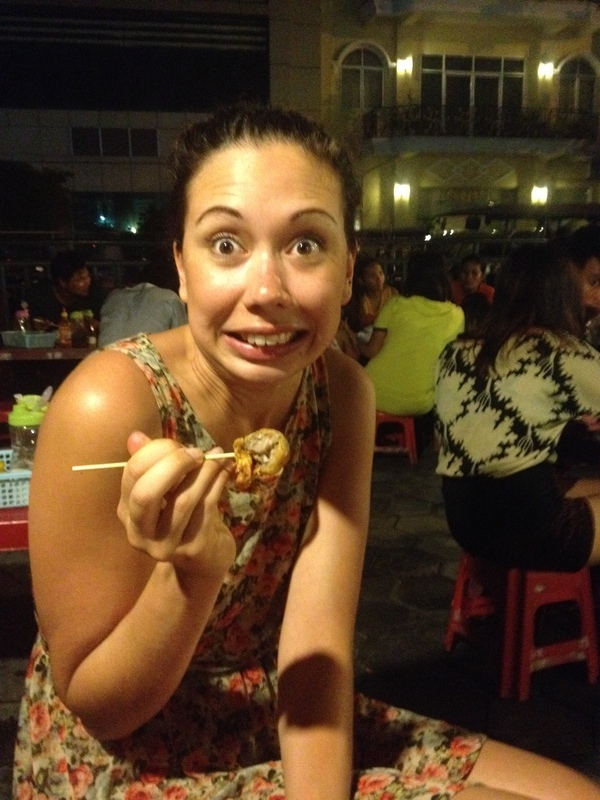 I didn’t really know what to expect food wise in Cambodia but I was very pleasantly surprised. We were also extremely lucky that despite not being overly cautious we managed not to have any major tummy troubles…or the swirls as someone we met named it! During the first few days I was really nervous about food and the conditions it was prepared in and whether it had been washed in tap water but I soon realised I had to just get over it. A bit like crossing roads it was best to just not look and not think about it too much. 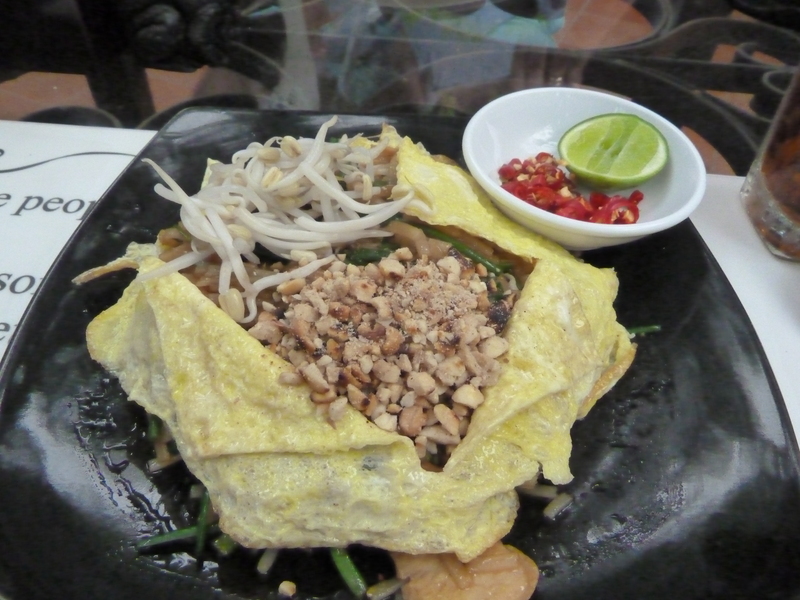 There are a few traditional Cambodian dishes such as amok, Khmer curry and beef lok lak. 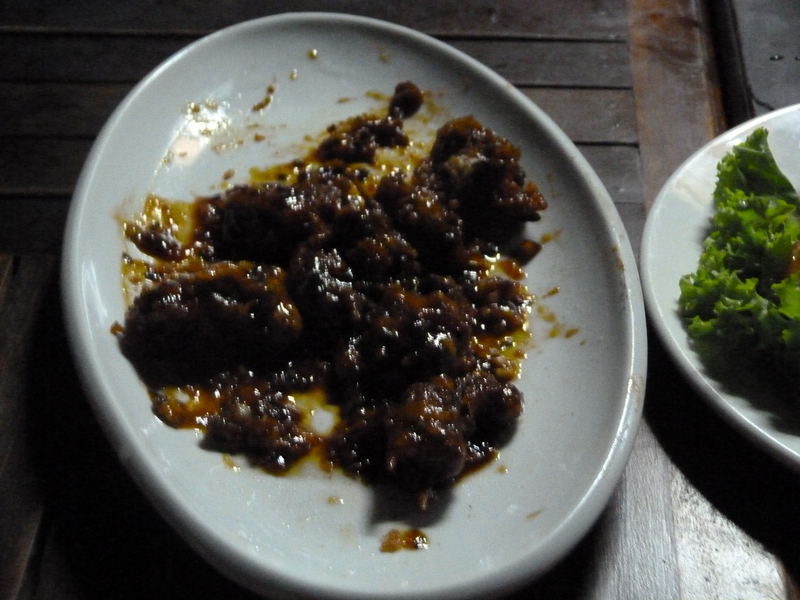 Amok was my favourite and consists of meat or fish cooked in coconut milk and served in banana leaves. The fresh spring rolls were amazing. In Siem Reap look out for the Khmer Family Restaurant. (There are two or three in the pub street area). This restaurant offers a Khmer curry, amok, spring rolls and rice for two or $15. You can also get a pitcher of beer for $2. 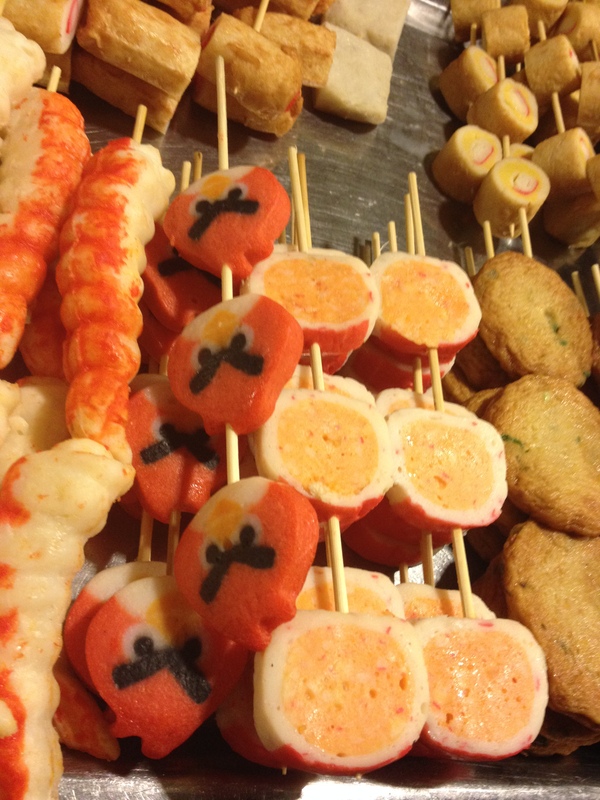 BBQ and slightly more unusual meats are also very popular. 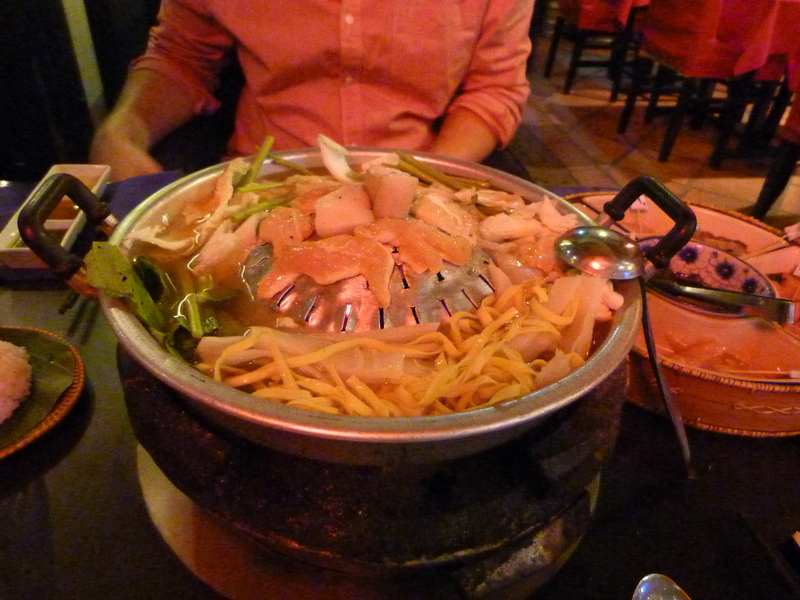 We ate at the Khmer BBQ restaurant where you got 7 different kinds of meat (pork, squid, chicken, beef, shark, crocodile and shrimp) and unlimited vegetables and noodles and cooked it all yourself on a little BBQ in the middle of your table. 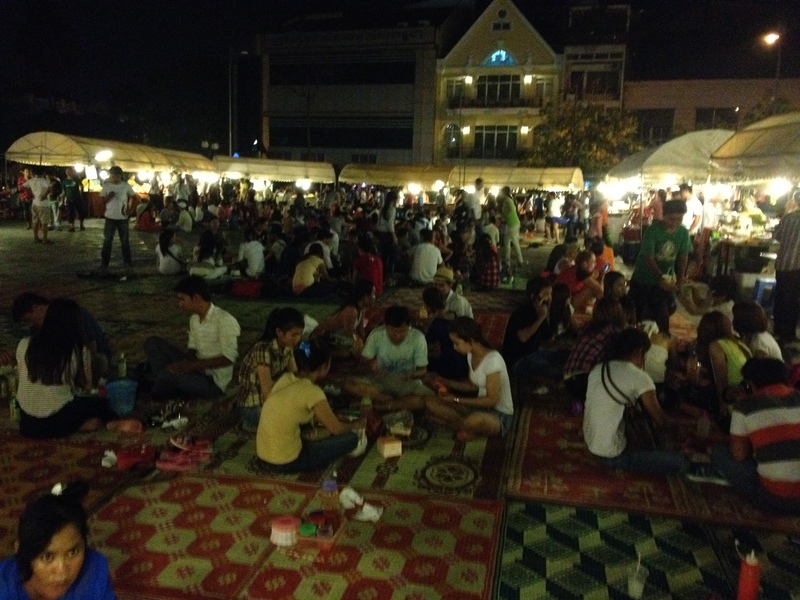 The best food we ate was probably some we bought at a street stand at the night market in Phnom Penh. After a refreshing cup of sugar cane juice we selected some mystery food from one of the stands that seemed popular. We weren’t entirely sure what we were eating. There were some questionable meat balls and some spring rolls but I don’t really know how to describe anything else. Another interesting experience with food was a meal prepared by the Cambodian family that owned one of the hotels we stayed at. They were celebrating the Khmer New Year and invited us to join them. We had already eaten so just had a little taste of a few things they had on the table including whole baby birds. I didn’t know exactly what they were when I was offered them but couldn’t really refuse when the guy who cooked them proudly told me he had made them and they were very nice. Luckily it was only after I’d eaten it that I was told what it was! The sauce it was cooked in was quite strong so it could have been anything really! Drinks are Cambodia are incredibly cheap. I don’t think we ever paid more than $1 for a beer and a pitcher of beer was $2. Cocktails were usually $3 but most restaurants/bars seemed to have never ending Happy Hours where drinks including cocktails and spirits and mixers were $1.50. Only wine was expensive. One night we ordered a bottle through force of habit and it was $19. 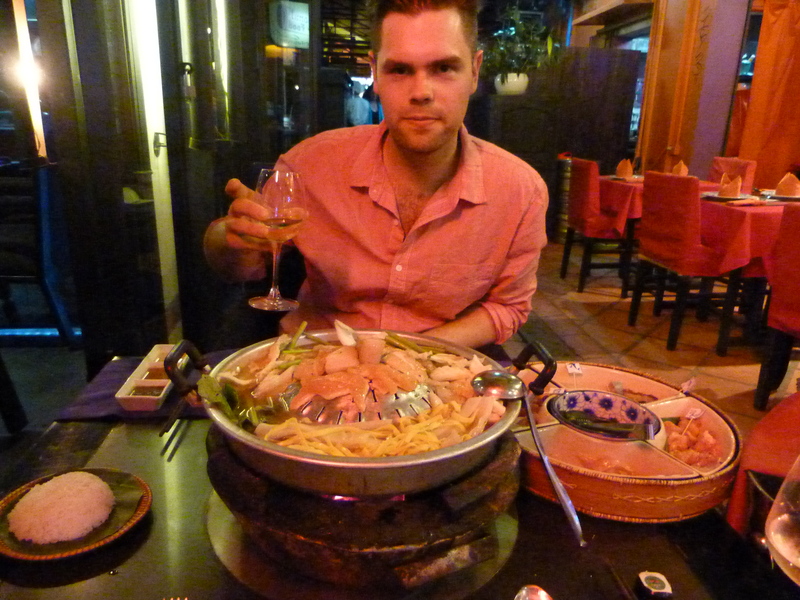 This was more than we paid for most meals in Cambodia! 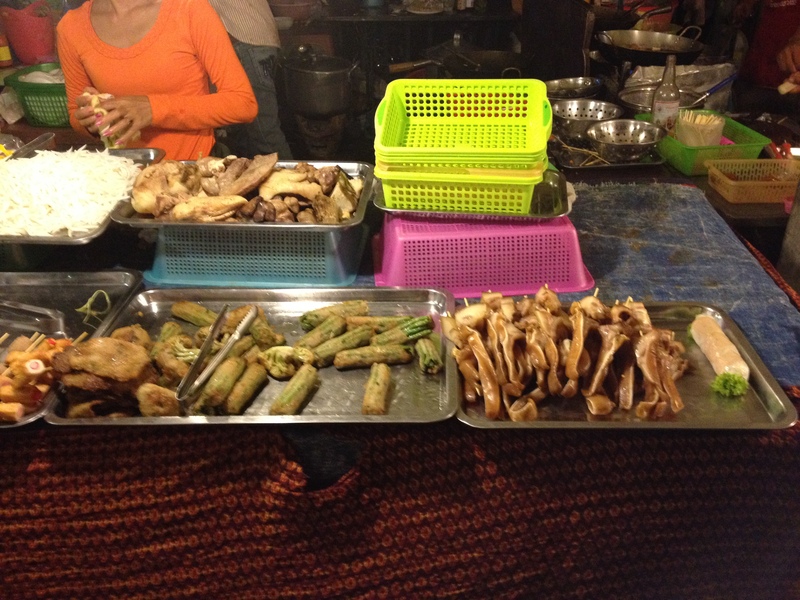 Previous Post Phnom Penh part 2! Food is definitely a great way to immerse in a culture. I’d love to visit Cambodia someday myself. Best of luck to you and happy travels!